Ali's workshop was a delightfully relaxing way to reflect on what is important to me at this point in my life. I enjoyed paying attention in such a playful way. A refreshing and illuminating session, providing me with an effective way of sorting priorities and Setting out positively to achieve goals. I really enjoyed the Future Perfect workshop I attended. Ali has such a wealth of experience and knowledge which she so gladly shares with all. Her wisdom and positivity made the workshop thought provoking, interesting, relaxing and useful. It was a great opportunity to get connected both with myself and others. Thank you Ali! I found it an inspiring workshop about the most crucial aspect of life, my life, it regularly gets overlooked, no, probably it's constantly overlooked! I took comfort from the similarities I found when working with everyone in the group, the details were different but some fundamental aspects were the same and it was nice to know I was not alone. My picture worked in two parts and it fits beautifully above my bed so I see every morning and night, which helps me focus on my goals. I've achieved one small goal, a beautiful table filled with lovely items set for entertaining a happy family group, I cheekily borrowed (because I could clearly see it) glasses and decorations and mixed with what I own and made a stunning, sparkly table this Christmas, it helped set the tone for a fabulous day. When entertaining before I've never been happy with the 'make do' table setting that I'd achieved. It felt good to put a mental tick by a goal, and that drives me on for more! A great constructive workshop, I enjoyed the positive creativity, and love that it is still with me in my pictures, to remind and inspire me for the months to come. This workshop makes you visualise what you want to achieve and wish for in your future. Ali's stories of true situations of her life experiences captivates you into believing it is possible to have the good things in life. Working with each other in the group makes you enthusiastic and excited about discussing your goals and the relaxed atmosphere created with soulful music and Ali's soothing voice gives you a positive feeling of relaxation and wellbeing. 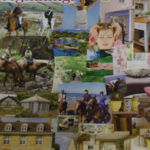 Creating a collage from magazine cut outs is great fun and allows you to express your feelings visually and is a brilliant way of showing your inspirations to other people. I would definitely recommend this workshop to anyone that has a vision, who wants to get on with life and fulfil their dreams and expectations. It is truly uplifting and Ali's expertise in her work can inspire you to see you can achieve it! A truly wonderful experience set in a beautiful country home, in the rolling countryside of the chilterns hills.